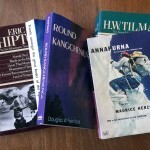 Our trip to Tanzania prompted me to re-read Snow on the Equator by H.W. (Bill) Tilman. 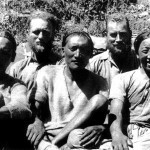 Better known as a Himalayan explorer, Tilman actually spent fourteen years of his life in the 1920s and 1930s as a coffee planter in Kenya (then known as British East Africa). 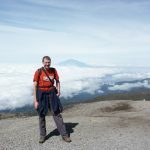 During that time he made a number of exploratory treks and climbs on Mount Kenya and Kilimanjaro, and in the Rwenzori Mountains of Uganda with another coffee planter, Eric Shipton. A few years later Shipton and Tilman would both hold records for reaching the highest summit ever climbed (Shipton on 7,756m Kamet and Tilman on 7,816m Nanda Devi), but their mountaineering partnership in Africa started inauspiciously, with a failed attempt on 5,895m Kilimanjaro. By 1930 Kilimanjaro had been climbed several times, and was already a playground for local hiking and climbing clubs. Huts had been built on the Marangu Route. One, Peters’ Hut, was at 3,500m, close to where Horombo Huts are now. Shipton and Tilman hired a local guide called Solomon, who had been almost to the summit, but not quite. He led them to a cave that Hans Meyer had used during the first ascent of Kilimanjaro in 1889. At around 4,600m, it is not the same as the Hans Meyer’s Cave at 5,240m on the Marangu Route today (which was probably buried beneath a glacier in Meyer’s day). They set off from the cave at 4.30am, and reached Gillman’s Point on the crater rim at 10.30. The summit was in cloud, and Solomon decided that was enough for him. From Gillman’s Point to the summit, Uhuru Peak (which in those days was known as Kaiser Wilhelm Spitze), the route passed over a series of rocky summits. These days an easy trail passes underneath them, but Tilman and Shipton had to cross over the top of them. They reached Stella Point, but were suffering from a combination of altitude sickness and boredom. They had no clear idea how many more bumps they had to cross before reaching the highest one, and when another appeared out of the mist, they decided they’d had enough, and turned around. Tilman was candid about their achievement. When a party fails to get to the top of a mountain, it is usual and convenient to have some picturesque excuse … the reason for our retreat was the more prosaic and not uncommon one – inability to go any further. Imagine that – two of the great mountain explorers of the 20th century failed to get up Kilimanjaro because they were too knackered! Three years later, in 1933, Tilman returned to Kilimanjaro to put the matter right. Shipton wasn’t available, so he climbed the mountain solo, with no guide or porters. 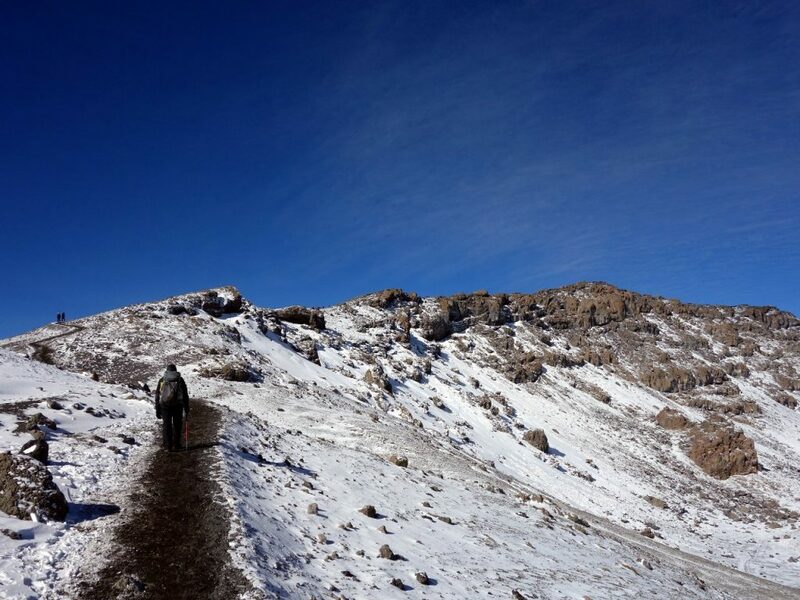 He carried his own pack with seven days’ food and a sleeping bag, but no tent, which he decided was too heavy. He was keen to point out that he wasn’t being particularly intrepid – he would be taking advantage of the huts that had been built on the mountain, including a new one on The Saddle, close to the cave where he and Shipton stayed in 1930. For various reasons, he performed better this time. The day was sunny and cloudless when he climbed, setting off at 5.30. He was more experienced at high altitude, and moved quickly. The local climbing club had now erected signs on each of the summits of the crater rim, along with a visitor book in a tin box for Tilman to record his name. This left him in no doubt about which summit he was standing on (today there are ‘summit’ signs on each of Gillman’s Point, Stella Point and Uhuru Peak). Tilman reached the highest point at midday, and barely paused to celebrate, before descending to camp in the crater, under a large rock, in just his sleeping bag. Before going to sleep he explored the outer and inner craters and made a discovery about Kilimanjaro’s volcanic activity that I mentioned in last week’s post. He also learned something about altitude sickness, a discovery that many frequent travellers to high altitude have made since – that you perform better at high altitude the more times you go there. In 1930 I was sick at 17,000 feet, sick most of the way up, and on top suffered from excessive willingness to sit down, whereas this time it was only after some hours on top (having also carried a load there) that I felt there was a remote possibility of losing my breakfast, but actually did not. If Tilman’s trips up Kilimanjaro were only slightly better than you or I could do, his climb of Mount Kenya with Shipton was truly pioneering. Tilman was a novice then. Shipton was the more experienced climber and did nearly all the leading, but Tilman was fearless, and there was nowhere Shipton went that he wouldn’t follow. 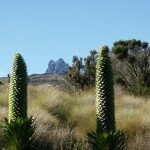 Unlike Kilimanjaro, which you can walk up, Mount Kenya’s two main summits, Batian and Nelion, are lengthy rock climbs. In 1929 Shipton made the first ascent of the lower summit, Nelion, with Percy Wyn Harris, and completed the climb with a full traverse of Batian. They did the same route again a few days later, and Shipton repeated it with different climbing partners later in the year. He also climbed a new route on another of Mount Kenya’s summits, the needle-like Point John. In 1930, Shipton and Tilman made the first ascent of Mount Kenya’s West Ridge, a severe knife-edge with many pinnacles. They traversed underneath some of them, while on others they had no choice but to go over the top. In several places the ridge was so narrow that they had to straddle it, testing the fabric of their trouser seats. They never expected to reach the summit, but the ridge was severe, and going back the way the came wasn’t appealing, so they kept going. At 4.30 in the afternoon, after 12 hours of climbing, they crossed a short section of ice and arrived on the summit of Batian in mist and light snow. Shipton knew the way down from there, but there were only two hours of daylight left, and they were very tired. They crossed the Gate of the Mists, an eerie col between the two peaks, and climbed Nelion. By now they were reaching the end of their tether, but there was still a long way to go. Tilman broke the pick of his ice axe driving it into the snow, and then dropped it altogether trying to arrest a fall. It skittered down the mountain and he had to complete the descent without it. Shipton was seized by feed poisoning after eating a ‘meat essence’ on the summit of Batian, and had to keep stopping to throw up. It was 9pm, long after dark, when they completed the final technical abseil off the glacier onto firmer ground. Their camp was still four of five hours away, across the summit of a third peak, Point Lenana. They remembered there was a hut nearby. They broke into it, and snatched a few hours’ rest before leaving at dawn for the final trek over Point Lenana back to camp. They reached their tents at 8am, 28 hours after leaving. Tilman and Shipton’s other notable climbing adventure in Africa was in Uganda’s Rwenzori Mountains. It forms what is probably the most entertaining chapter of Snow on the Equator. I went to the Rwenzoris myself in 2006. It’s one of the strangest places I’ve ever been. Most of the range consists of wet jungle hanging in a perpetual mist. Weird giant groundsels are everywhere, with their soft tree trunks and strange cabbage-like crowns. The trails are a quagmire of mud. There is a lot of wading through damp bog, and striding across rotten groundsel trunks that have fallen over and are sinking into the mire. But occasionally you can climb above the clouds. The Rwenzoris contain six mountains, all with multiple summits. We climbed Mount Stanley, Mount Speke and Mount Baker, the 3rd, 4th and 5th highest mountains in Africa, respectively. Each is different. 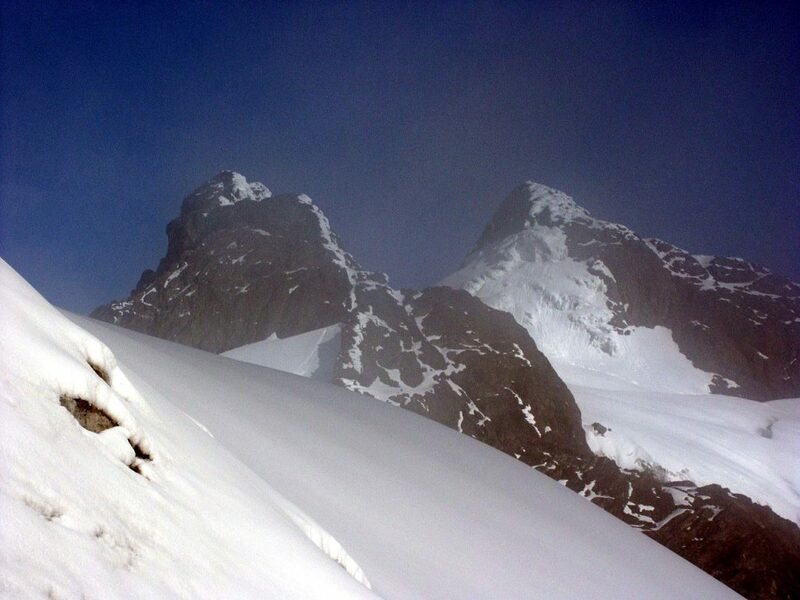 Stanley is glaciated, with a broad snow plateau, while Baker is a long rock scramble. Speke is a mixture of the two. Tilman and Shipton camped on the Stanley Plateau, hoping to climb its two main summits, Margherita and Alexandra. But the clouds made navigation difficult, and they caught only brief glimpses of the summits during a break in the weather. They had to abort their first attempt on Alexandra when they became lost in a whiteout, and were afraid their tracks would be covered in fresh snow. The mists cleared briefly the following day, and they were able to follow a ridge to the summit of Alexandra, where they found a note from the Duke of Abruzzi, who made the first ascent of the peak 26 years earlier. The next day they tried to skirt around Alexandra and find a way up Margherita. The weather was still bad, and they found themselves guessing the route. A rock buttress emerged from the snow, and they climbed it. At the top they reached a ridge and turned up it. Here they were astonished to come upon a set of footprints. Whoever could be on the mountain with them? They realised they were their own footprints from the previous day, and they were climbing Alexandra for a second time. They return to camp with their tails between their legs. The following day they tried to climb Margherita again, but it was still misty. They still weren’t sure which peak they were climbing, as Tilman described. Once more a rock buttress loomed up. It was viewed with suspicion and tackled without enthusiasm, while every moment we expected to come once again upon our old tracks. They didn’t, and they reached another summit at one o’clock, but was it the right summit? There was no note from the Duke of Abruzzi this time. They dug a hole in the snow, and waited for the clouds to clear so that they could see where on earth they were. Several hours later, a brief break revealed the summit of Alexandra across a col, and they decided from their relative position they must be on Margherita. I don’t know whether they were. Tilman may also have climbed the wrong mountain when he claimed to make the first ascent of Paldor in Nepal many years later. He wasn’t lying; it’s just that he didn’t know any better. If they were on the summit of Margherita, the highest point in the Rwenzoris and also the highest point in both Uganda and the Democratic Republic of Congo, then why didn’t they find a note from the Duke of Abruzzi there? His lordship climbed all six Rwenzori peaks during a remarkably successful expedition in 1906. He had diligently left a note on the summit of Alexandra, and you would expect him to have done the same on Margherita. It doesn’t really matter. Tilman wasn’t a man to lie about his achievements, as his and Shipton’s lame first attempt on Kilimanjaro demonstrated. The important thing for me is that his account of their Rwenzori adventure is hilariously funny, and could be lifted from the pages of The Ascent of Rum Doodle. I can’t say the same for all of the book, though. Snow on the Equator was Tilman’s first travel book, and covers his life in Africa. 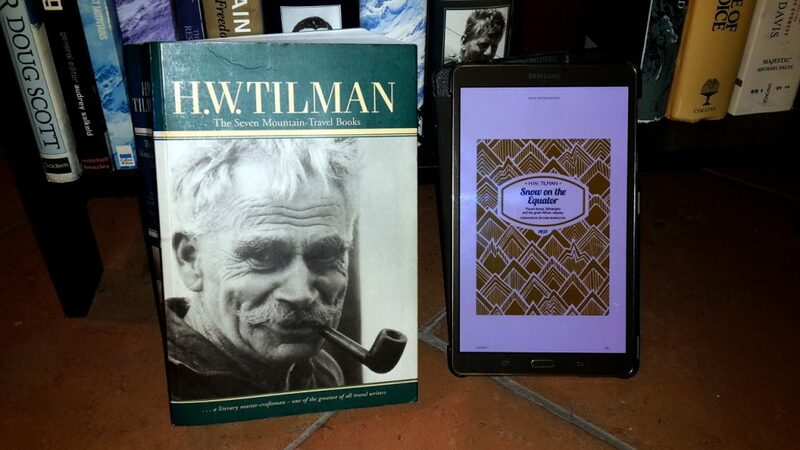 Although there’s lots of interest to fans of mountain writing, it’s very much a book for die-hard Tilman fans, and should only be read by people who are accustomed to his later work and style of writing. His descriptions of African people are awkwardly old-fashioned and dismissive (he refers to them throughout as ‘natives’, at one point describing them as ‘scarcely human’). This does no credit to a man who a few years later would champion the cause of Sherpas and introduce Tiger Medals to recognise the best of them for their achievements. Three chapters of the book are about elephant and rhino hunting in the Masai Mara. At best these sections make uncomfortable reading for the modern reader. At worst the accounts of elephants being shot in the side from close range, and their carcasses stripped for tusks and meat, are quite offensive and really should contain a warning. I made the mistake of lending my copy to Edita, and she was shocked. I don’t know whether she will read any more of Tilman’s books. I had a recently reissued copy, published by Tilman Books, which contains a new introduction by Sir Chris Bonington. Sir Chris makes no mention of these things, but perhaps he should have done, as many people will find them off-putting. But people who are more familiar with Tilman’s life and writing will recognise that he was a product of his time, who may well have modified his views over the course of his life. He was a pioneer, who delighted in the natural world. It is difficult to reconcile the chapters on hunting safaris with some of his later writing. The second part of Snow on the Equator recounts a slightly more unusual adventure, when Tilman road a bicycle 3,000 miles across West Africa, surviving on a diet of bananas. He passed some of the Virunga volcanoes, but otherwise he saw no mountains until he reached the sea, where Mount Cameroon rose above the port of Douala. Much less has been written about the mountains of Africa than other parts of the world. I don’t know why this is. Perhaps it’s because most of them are easier to climb, while climbing and mountaineering literature tends to focus on the epic. This is a shame. I have a fondness for Africa’s mountains, and I’m determined to read more about their history. Any recommendations would be welcome. I think that “No Picnic on Mt Kenya” is one of the most entertaining books about African Mountaineering. A great read as always Mark. I can recommened reading ‘Shipton & Tilman The Great Decade of Himalayan Exploration’ by Jim Perrin, it’s a excellent read!